Narrowing down your elopement to Los Angeles doesn’t feel like much progress in the planning process with the multitude of different places to choose from within LA county alone. Do I want a beach elopement? Which beach do I choose, Malibu or Santa Monica? Which Malibu beach? I knew I had to write this post after one too many brides came to me stressed about where to have their Los Angeles elopement, wedding, or even something as simple as an engagement session. Every step forward seems to open a Pandora’s box of new options to review and decide on, which I why I decided to write this. I’ve written about how fun this city is to shoot in for a destination wedding photographer but never as a good place to elope, which it honestly couldn’t be better for. In my time as a Los Angeles elopement photographer, I’ve shot all throughout the city in several different environments. I can’t hope to possibly go into detail about every spot on the coast where the light is just right, or every park with gorgeous greenery perfect to exchange vows but I can happily throw in a few of my personal favorites. Here are the places I’d jump to shoot in as a part of any Los Angeles elopement package! The Pacific coast is littered with incredible locations for an elopement, and southern California certainly is no exception. With beaches rivaling France and Italy, it’s easy to see why a couple would choose the shores of Malibu for their elopement. Being a frequent visitor of SoCal myself, I’ve had the opportunity to shoot at several beaches and these two, outside of Orange County, are my absolute favorite. Although this may not be the right choice for someone with more tropical tastes, it serves as a stunning backdrop for anyone who loves the Pacific Coast. As an elopement photographer in Los Angeles, I’ve always got my eyes peeled for spots that might be a good fit and these are my favorite ones I’ve been able to shoot at so far! There’s plenty of reasons why this small town on the coast has an international reputation but if there’s one thing it should be famous for I’d say the beaches deserve the most celebration. A Malibu elopement means cliffside views, jaw-dropping beaches, and only the sound of waves crashing to soundtrack the special occasion. The photos above are from Matador State Beach, which is often called Malibu’s best-kept secret. In the summer, the water is nice enough to dip your toes into which makes it perfect for a Los Angeles elopement but be warned – it’s less forgiving in the wintertime. A fellow Los Angeles elopement photographer once told me that the beaches there were more romantic than anywhere else in LA. I not only agree with her statement but wouldn’t hesitate to add serene, enchanting, and stunning. I recommend a Malibu elopement for any couple who doesn’t mind getting the ends of their jeans/dresses a bit wet and sandy! I hesitated when I was asked to do a Santa Monica couples shoot, especially at the pier, because I expected it to be cheesy and I’m all about shooting what’s real and authentic. What I got instead was perfect lighting, beautiful ocean views, and a super fun atmosphere. Hearing the sounds of people’s joyful shouts on the different rides at the pier doesn’t necessarily make for an intimate setting but it does add an element of lightheartedness that’s very unique to the city. Shooting any Los Angeles elopement at sunset means golden light but adding sand between your toes and glassy water makes Santa Monica a hard location to pass up, especially if you’re a beach person like I am. Throughout the session, the light only got better and better as the harsher yellow light turned into a sweet golden glow that made it nearly impossible to take a bad shot. I never thought, as a Los Angeles elopement photographer, I’d be shooting here but I’m so glad I did. I recommend a Santa Monica elopement for any couple that doesn’t mind being surrounded by other people and that loves the beach. Although some of the beaches I mentioned above are technically included when referring to West LA, I’m specifically talking about the cities inland, closer to downtown. 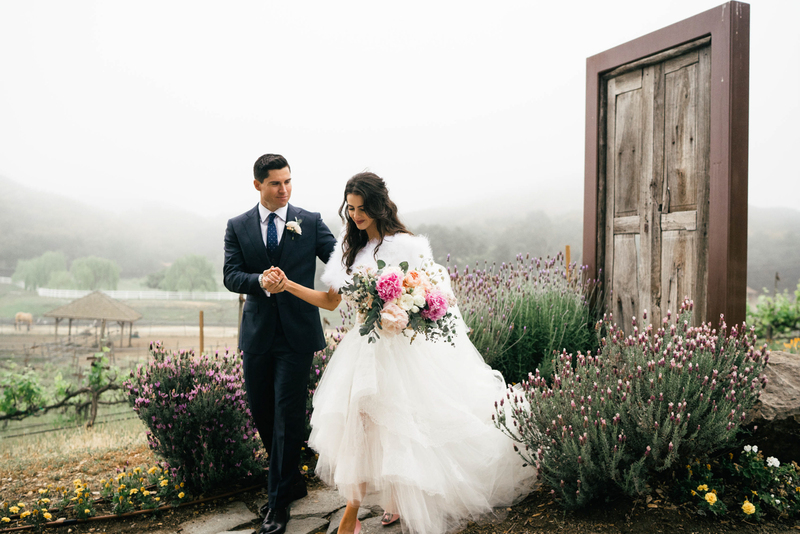 The Los Angeles elopement spots that immediately come to mind are rich with color, impeccable design, and beautiful nature. For anyone who doesn’t like the feel of sand at their feet and would rather have closer to a Gucci store, a West Los Angeles elopement package might be a more appropriate fit. An urban elopement is definitely an unusual option but for those heading to the courthouse but I think using the city around you is a stylistic choice that often goes unappreciated. Here are a few options for those who want to strut the palm tree-lined streets in their wedding clothes for their Los Angeles elopement. If you’ve always considered yourself to have expensive taste, there’s a city in LA made just for you. If the coast doesn’t appeal to you, I recommend heading east to one the many beautiful locations in Beverly Hills. A place that seems like an extravagant Instagram post brought into real life, Beverly Hills is a dream for a Los Angeles elopement photographer. There are a multitude of parks and beautiful streets to use as the backdrop for any couple. Shooting casually with friends in Beverly Hills has taught me that every carefully maintained street and park is a photo opportunity. In every season except Autumn, which I recommend you head north to a different destination for, Beverly Hills makes for a great place to tie the knot. Not to mention the variety of traditional wedding venues that are of course drop dead gorgeous and are happy to host an elopement ceremony. The line between intimate wedding and elopement is thin and I would usually say the line gets crossed based on the volume of guests rather than the venue so don’t feel like you’re not eloping if you go with a wedding venue. The first time I visited West Hollywood, the sky was bright pink with swirling clouds. Outside of a Coffee Bean, I sat and thought about how I wished I could be shooting because of how beautiful this would end up for a Los Angeles elopement photographer. The pastel colors that occupy the sky on LA evenings are particularly special in West Hollywood. Maybe it’s the vibrancy of the city or the amount of color on the walls of the unique shops and restaurants that line the streets. Whether your first date was in WeHo, or like me, you love a great sunset, any Los Angeles elopement package would be well utilized in West Hollywood. Choose WeHo if you want trendy without being pretentious, hip without being slick, or urban without being too edgy. I’ve haven’t been shy in talking about how much I advocate for Los Angeles as a fantastic place to get married, one of many excellent choices for a California wedding. You’re in great shape if you choose the beach, anywhere from Hermosa all the way up to Malibu. I would just as easily advise using your Los Angeles elopement package further east, whether it be a downtown loft or a palm-tree lined street in Beverly Hills. Any article about places to elope in Los Angeles, no matter how comprehensive, isn’t going to include every available option. You may have a place in mind that’s special to you for a reason I couldn’t guess in a million years! At the end of the day, if you’re choosing Los Angeles, know you’re going to have a beautiful elopement no matter where you end up having the ceremony. Whether you’re inspired to head to Matador or want to choose somewhere special to you, I’m happy to be a part of the planning or the elopement in any capacity. Reach out with any comments or questions by filling out a form submission and we’ll get a conversation going about your Los Angeles elopement photographer needs!